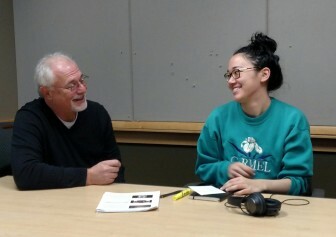 IowaWatch Executive Director-Editor Lyle Muller tells photographer Danielle Wilde (right) on Nov. 13, 2015, that she has won the IowaWatch/Fotini Perlmutter Award for outstanding work with the nonprofit news organization. University of Iowa student Danielle Wilde has won the 2015 IowaWatch/Fotini Perlmutter scholarship, an annual award given for outstanding investigative reporting. The award, funded with a grant by former University of Iowa School of Journalism and Mass Communication Director David Perlmutter, is presented by the Iowa Center for Public Affairs Journalism-IowaWatch to an undergraduate volunteer staff member who has worked with the center for at least one year. The winner must also show an interest in pursuing investigative journalism. The award includes a $250 scholarship. Wilde, a staff photographer at IowaWatch, is a senior studying journalism and mass communication, and studio arts with an emphasis on photography. 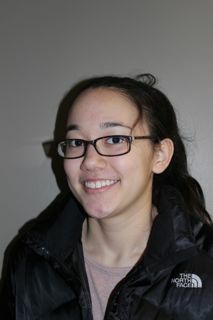 Wilde previously has worked with SHiFT Magazine at San Jose State University as an intern. Perlmutter was the director of the School of Journalism and Mass Communication from 2009-13, resigning to become Dean of the College of Media and Communication at Texas Tech University.